SCOTTY is pleased to announce that Bear Defense Services LLC of Tampa Florida is the first customer to deploy the SCOTTY Communication Platform (SCP) on a surveillance aircraft. 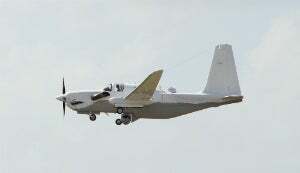 Bear Defense Services, a leading provider of aviation services for government and civilian agencies, has integrated the SCOTTY SCP into its NYX ISR® package onboard its G520 Egrett high-altitude, long-distance intelligence, surveillance, and reconnaissance (ISR) aircraft for missions operating in sensitive regions around the world. The SCP enables the aircraft to transmit high quality HD surveillance video from the plane’s observation turret, in real-time, over a specially configured satellite link, at lowest bandwidths, to operations headquarters on the ground. The SCOTTY solution is truly unique: the satellite link is bi-directional, compatible to the internet and is encrypted. Live airborne H.264 video is streamed to the SCOTTY ground system and can be shared with other clients within a virtual private network (VPN), while the backlink is used for the remote sensor station (RSS) and to communicate to the G520 Egrett’s cockpit. All of this means that staff on the ground, no matter how far away, can see the airborne imagery and targeting information live, control the airborne sensor, and talk to the pilot; making it possible to fulfill the long-range mission requirements.